Here in Denver, there’s been a recent cool front which is much appreciated since there has been so much heat! This cool front also brings the first hint of fall weather with the cool air and warm sun. The slight breeze and cool evenings. This is the perfect weather for a Homestyle meal! When I think of a Homestyle meal, I think of a cool day and night with a warm and hearty dinner. The foods that make you feel cozy and content. So this brings us to today’s great recipe brought to you by Ragu and their new Homestyle Pasta Sauces! I’ve always loved Spaghetti and Chicken Parmesan. I’ve also always made them for completely separate meals. This time, I figured I’d try something I’d never tried before and make them together. Can’t go wrong! Two amazing Ragu Homestyle meals in one dish! Boil the noodles and drain the water once cooked. In a separate pan, sear the chicken until fully cooked. Add the chicken to the noodles. 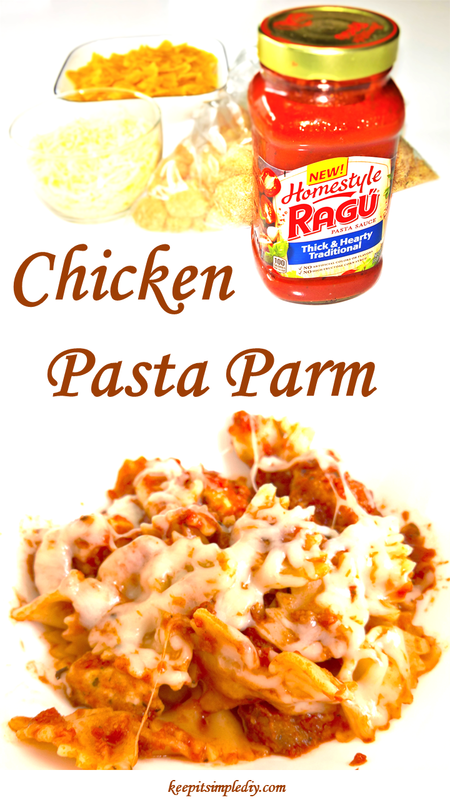 Pour Ragu Homestyle pasta sauce over the chicken and noodles and mix then top with cheese. And there’s a fantastic way to spend the upcoming cool nights. A warm home cooked, homestyle meal. I made this meal with enough to have leftovers for lunch a couple times throughout the week and was so impressed with the Ragu Homestlye sauce! Honestly, I usually go for the cheapest canned sauce I can find but after tasting the Thick & Hearty Traditional, I just may never go back to canned sauces again. This sauce has the perfect amount of flavor and just the right amount of sweetness. I will be adding this recipe to my box except I’ll use my homemade sauce, homegrown chickens and homemade noodles and mozzeralla cheese we make. Looks incredibly tasty I will add it to my Menu Planning this week although I may have to use Turkey – now we own chickens ! I do love Italian though so this recipe is right up my street. Ragu always reminds me of my mom. When we first came to this country, she wanted us to taste different foods. She loved Ragu! Thanks for sharing. Must give this recipe a go. This recipe looks simple and delish! SOmthing my whole family will eat! This looks delicious and will be added to my monthly meal planning! I love the simplicity if this recipe. Perfect for a weeknight! This looks so delicious and sounds so easy to make, I’m going to have to try this!